Upon exiting immigration control at Hong Kong airport I was briefly seized with the panicked realization that I was alone in a foreign country with no real plan. Oddly enough, Hong Kong’s subway system, the MTR, quickly put my mind at ease. The order, cleanliness, and copious English signage helped me to realize that I can do this. And I immediately started noticing the little Hong Kong-isms that would so delight me throughout my stay. For example, everywhere you go there are a lot of people employed as human directional signals, ushering people one way or another, or blocking their path. It was amazing to me how many people seemed to hold this seemingly trivial job. And how about how they call moving walkways “travelators”? Or how everyone runs to form a long line anywhere a soft-serve truck appears? Everyone loves the softee truck! In many respects Hong Kong seemed as dirty and smelly as any major city, but there were signs everywhere of a focus on sanitation, disease prevention, and public health. The SARS epidemic and bird flu left their mark on this region. One of the most interesting and saddest things I stumbled upon was a memorial in a Zen garden honoring doctors and health workers who died combatting SARS in its early days. The memorial was in Hong Kong park, which also sported a lovely (if slightly ironic) aviary. It was hard to get birds to pose for me. The weather was warm and the humidity intense, but all the locals were wearing pants and jackets. I wandered the Kowloon waterfront, but there was not much to see — a lot of it is closed for renovations. 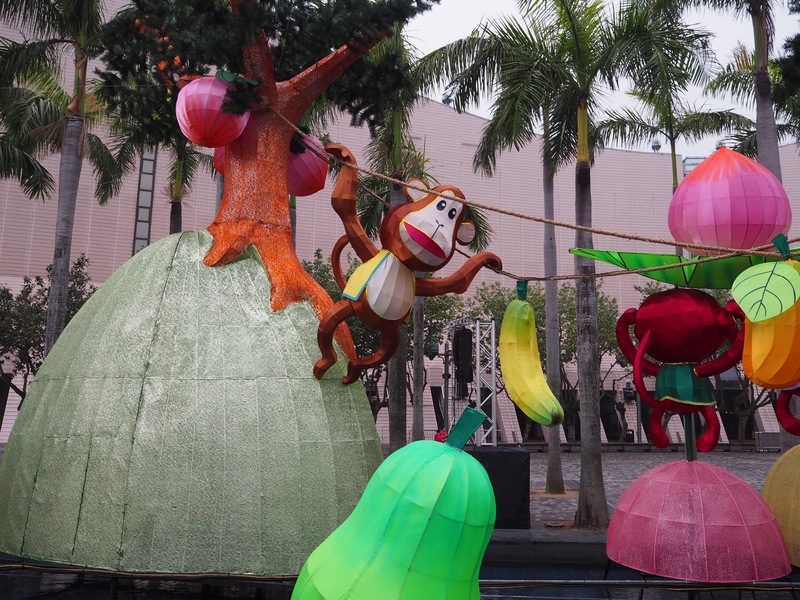 I had arrived just after the big Chinese New Year celebrations, so I missed the fireworks display but did get to see a lot of the decorations and art celebrating the Year of the Monkey. Most of my time in Hong Kong, the city was blanketed in fog. 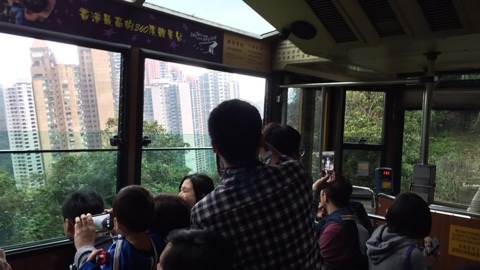 I visited Victoria Peak, high above the city, on a cold and overcast day, to find that there was nothing to see but a shopping mall. So I took an impromptu hike that ended up being a long, haunting, tiring adventure — I made a video that attempts to capture the strangeness and surprising beauty of the whole ordeal. A lot of Hong Kong felt just like New York City. Everyone had their nose in their phones, and the crush of people and buildings was intense. I wandered out to the Chi Lin Nunnery and Nan Lian Garden in Kowloon, which offered a nice change. Nestled serenely between high-rises and highways, the sprawling gardens and temple complex are both quite new — built in just the last two decades — but are designed in the classical Tang Dynasty Chinese style. Some of the buildings were built using classic techniques (no nails!) and other highlights included a pagoda, a restaurant under a waterfall, and a “rockery” where the finest rocks from their collection are shown off. I’ve never been to a rockery before. The descriptions of the rocks were quite something, on par with descriptions of fine wines or works of art, discussing the delicate grain and subtle textures of each stone. I tried to appreciate the beauty of each rock, but to me they mostly looked the same. Don’t you dare draw in these rocks! On the opposite end of the spectrum was the Wong Tai Sin Temple. This historic temple was completely overrun with Chinese tourists waving incense sticks in every direction. The smoke in the air was overpowering, the crush of people overwhelming, and the danger of being burned very real. Still, it was quite a thing to behold. I found the food scene surprisingly cosmopolitan, and had a lot of trouble finding the East-meets-West dishes I was seeking. There were plenty of places to get a hamburger, a burrito, or most any other cuisine, though. 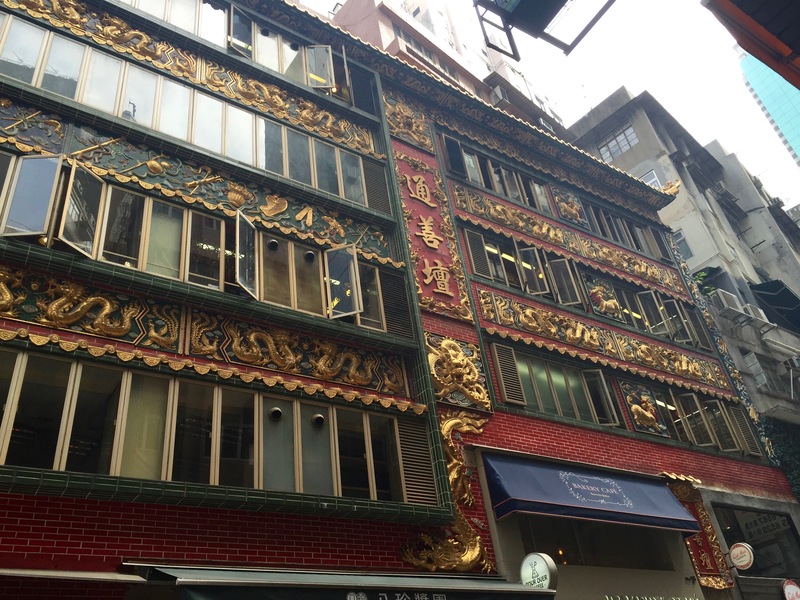 On my last day in Hong Kong I took a food tour and got to sample some of the more local dishes and establishments. If I had had more time, I would have tried to get even further off the beaten path. One dish I was delighted to rediscover was crispy french fries doused in salty curry powder in the British style. 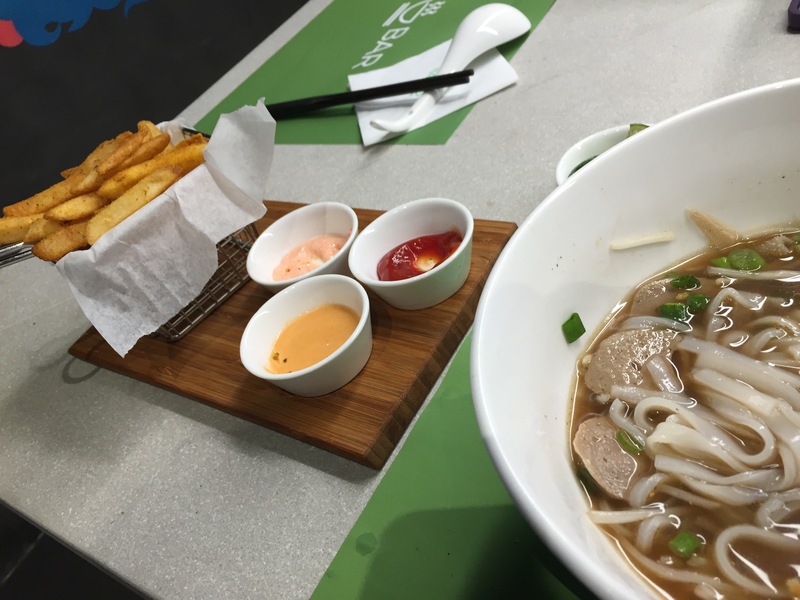 It was paired, oddly enough, with Pho in a trendy fast-casual restaurant hidden behind a clothing stall in a narrow alley. Why oh why haven’t curry fries made it to America? Most interesting-looking historic buildings and complexes that I would detour to check out ended up being shopping malls. Or banks. A surprisingly high proportion of the models in advertisement photos were white. It’s interesting being taller than almost everyone. In certain districts, I was constantly mobbed by guys trying to sell me suits and dress shirts. Sometimes they would follow me down the block. By the end I started getting good at avoiding those areas. Having an Octopus card (a stored-value card issued by the MTR) makes a lot of things much easier. It can be used for various attractions as well as the Star Ferry and to pay at many shops. But for a lot of the stalls and smaller shops, cash is the only option. Everyone, everywhere has their noses in their phones. In that respect, its much like home. Different is how adeptly they switch between Cantonese and English keyboards when composing their mixed-language text messages.